Valentine’s Day is coming up and my daughter is already so excited. She is already making all kinds of things to give to her dad and brother. 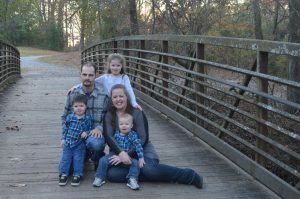 She loves to do things for others and I love that spirit that she has and I am hoping to teach that to my sons as well. 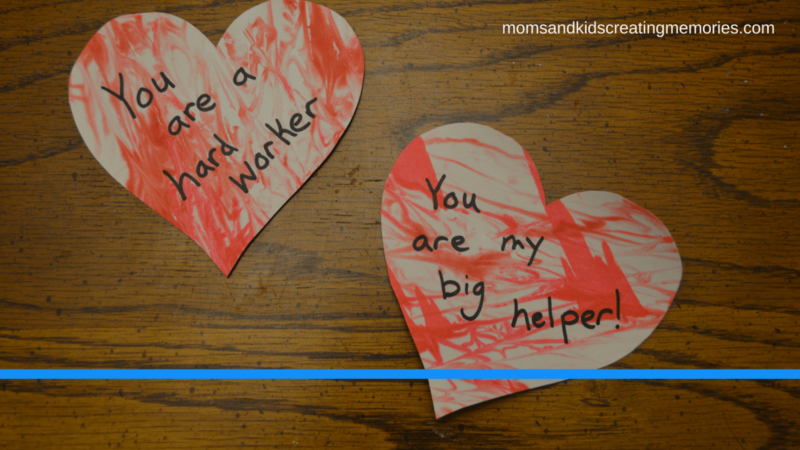 I’m sure many of you have seen ideas going around for leaving notes for your kids for Valentine’s Day. I love that idea but I want to change it up just a little bit. 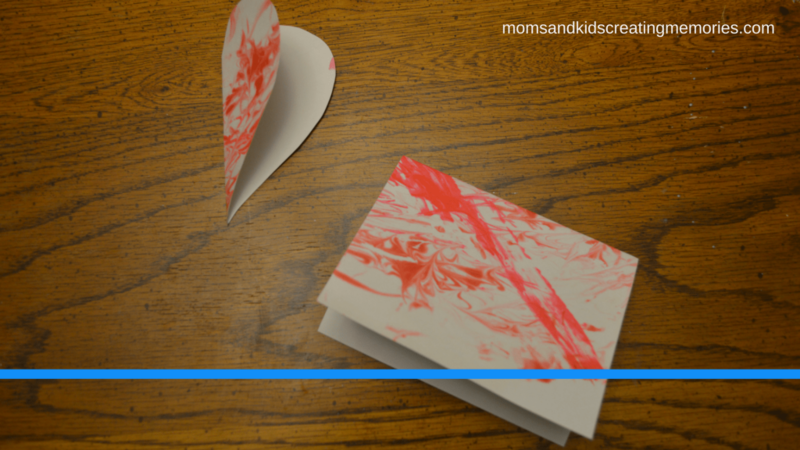 This is a fun craft and something meaningful for Valentine’s Day Fun. 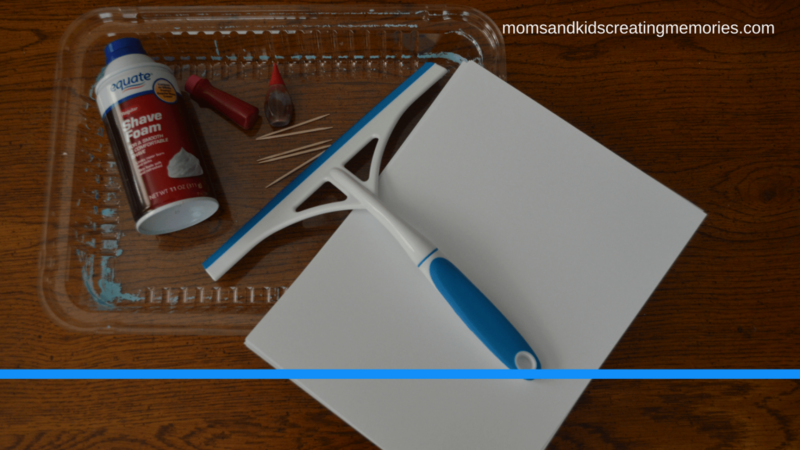 Once you have your supplies and your kids are ready for some fun it’s time to get started. Fill the bottom of you pan with shaving cream, depending on the age of your kid they might be able to do this themselves. 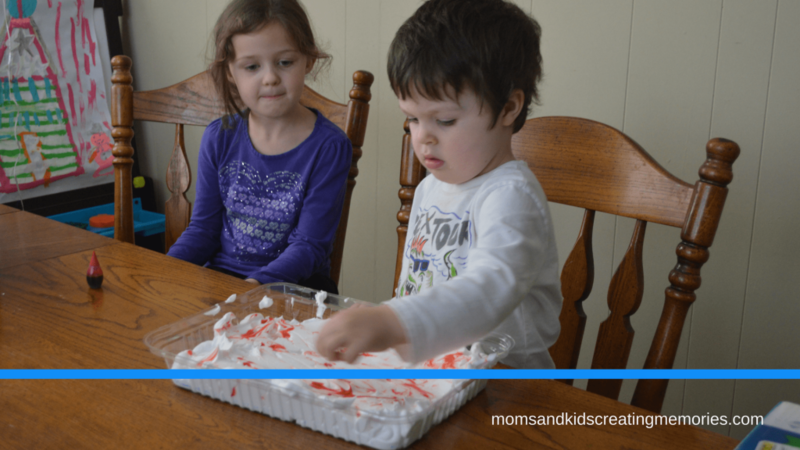 After the pan is filled with shaving cream you want to do drops of food coloring (we used red first and then added pink later) all over the shaving cream. Again depending on the age of your kids they will probably be able to do this themselves. After there are some food coloring drops all over give your kids a toothpick or coffee stirrer. Have them stir up the shaving cream so that the color gets mixed all over. We used toothpicks, because that is what I had. When we do it again I am definitely going to buy something that is a little bit longer so their fingers don’t get in the shaving cream. 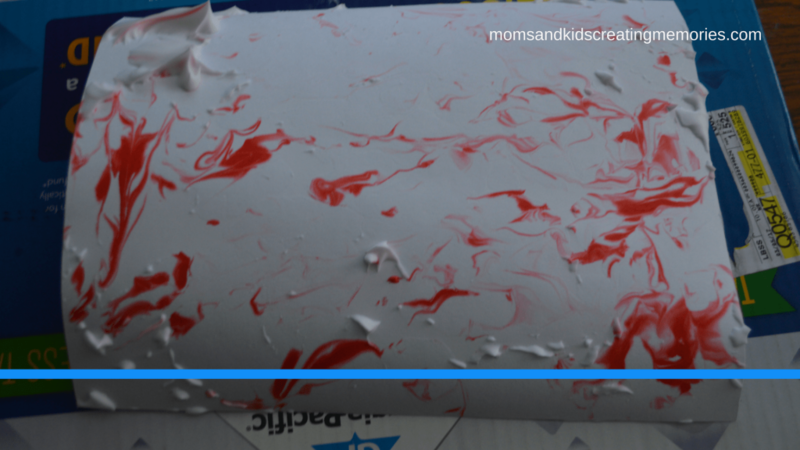 Once the kids have the food coloring all mixed around put a piece of cardstock on top and let your kids gently push it down onto the shaving cream. After the paper is all pushed flat so that the whole sheet of paper is touching the shaving cream then you pick up the paper. 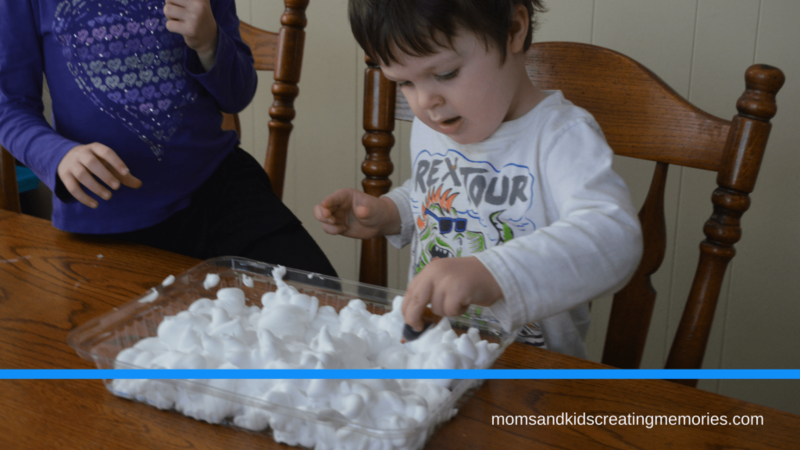 Put the paper onto something that can get a little messy (I used a paper box lid) and squeegee off all of the shaving cream. 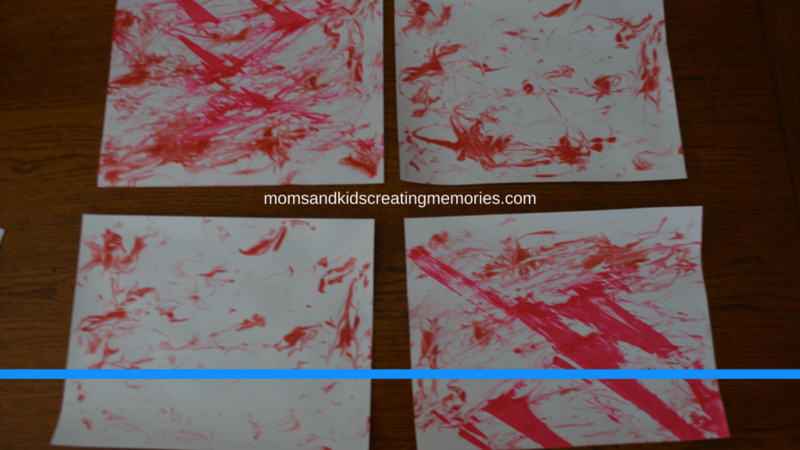 Set the paper aside to dry and let your kids do it again. 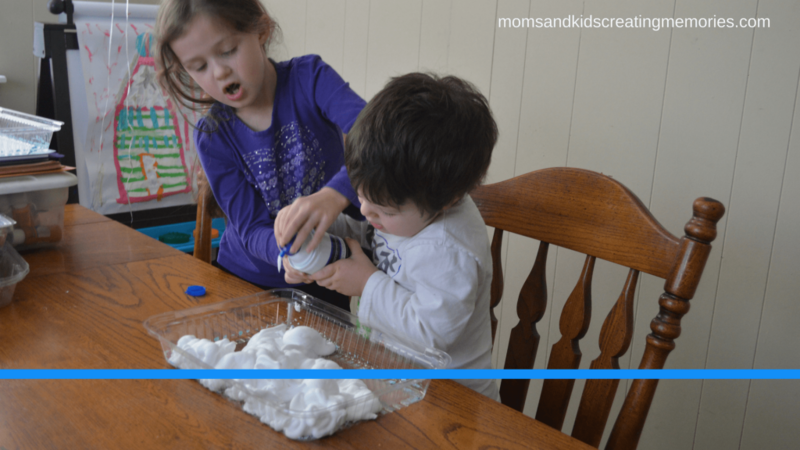 You can add more shaving cream or food coloring if you think you need it. 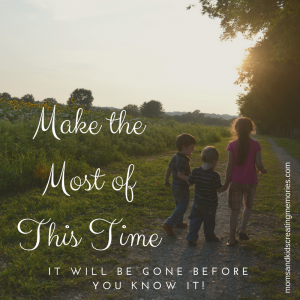 My two kids do it four different times and would have continued to do it if I let them. 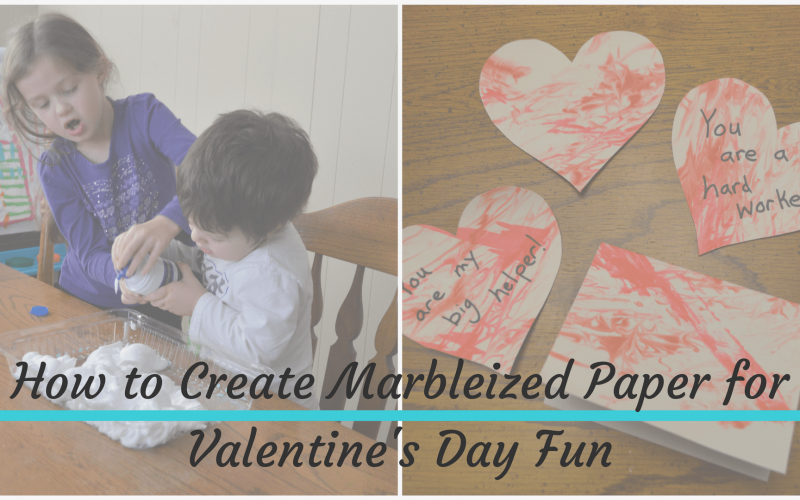 So now that your kids have created some marbelized paper there are many different things you can do with it. One of the ideas that I have are to make some Valentine’s Day cards out of it. Simply cut the paper in half and then fold it in half so make the card. Then you can write a simple message on the front or just write a special message on the inside and give it to someone special. I am going to have my kids write or draw a simple little something inside of it for a card for their dad. I have seen the idea to writing a new note to your child and putting it on their door every day (this website shows you that idea and has a great heart template). I thought instead have your child write special notes to their Dad and put it on the door so he can see them when he comes home from work. They get to have the fun of making the special paper, say what they love about their dad and then Dad gets to come home to something special every day. 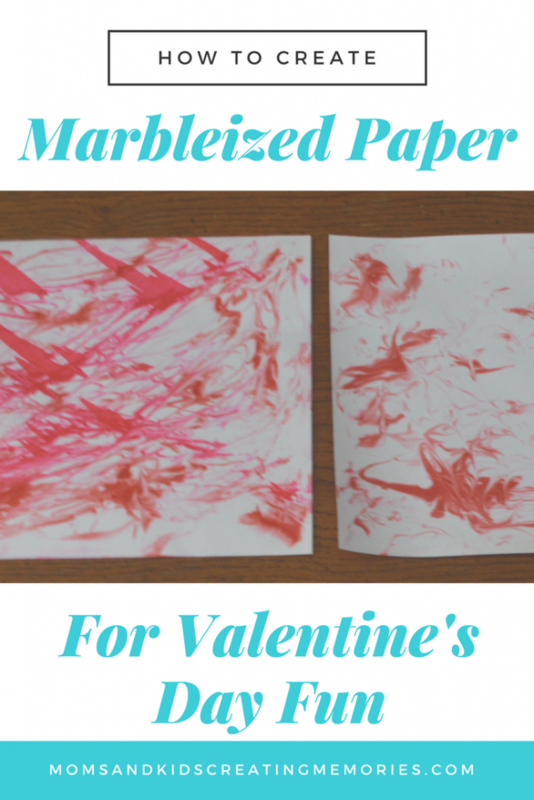 I would let you kids be creative and see what fun things they can think of to do with this special marbleized paper that they made. If you aren’t quite into the Valentine’s Day mood yet you can check out this fun Snow Crafts.